Make a few billion-dollar blockbusters. Buy a vineyard. Ride off into the sunset. Introducing Lasseter Family Winery, Pixar head writer/producer/director John Lasseter’s formerly private Sonoma winery, opening to the public by appointment for the first time today in Glen Ellen. First off, it’s nothing like Disneyland. There’s not much flash or even a hint of Hollywood ritziness. It’s been under the Lasseter family for nine years and feels lived-in—the sort of casual Sonoma winery you’d want to visit to get away from it all and hole up in the country. 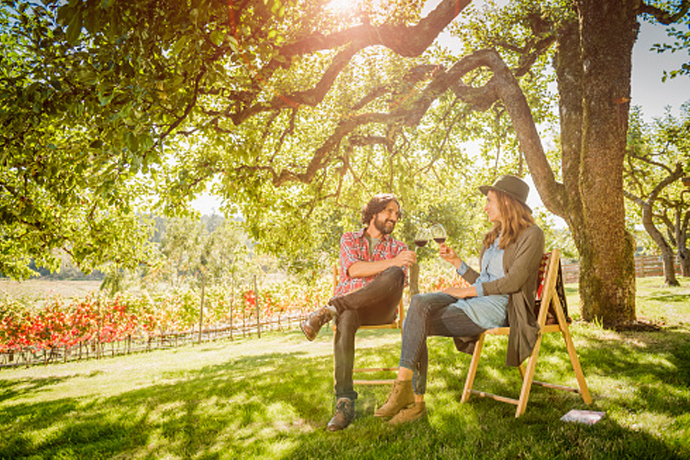 Get there a few minutes before your appointment and hang out on one of the Adirondack chairs made of old wine barrels to take in the acres of bordeaux and rhône vines growing on the benches and knolls. From there, you’ll be whisked inside the winery to the private tasting room, where a few magnums etched with the Cars logo are subtle reminders of the Pixar connection. But during the tasting you’ll notice the trademark Pixar storytelling coming through as each wine has its own backstory. The Enjoué rosé, for example, was inspired by the Lasseters’ trip to Cannes for the Up premiere. Okay, so just a small hint of the Magic Kingdom.